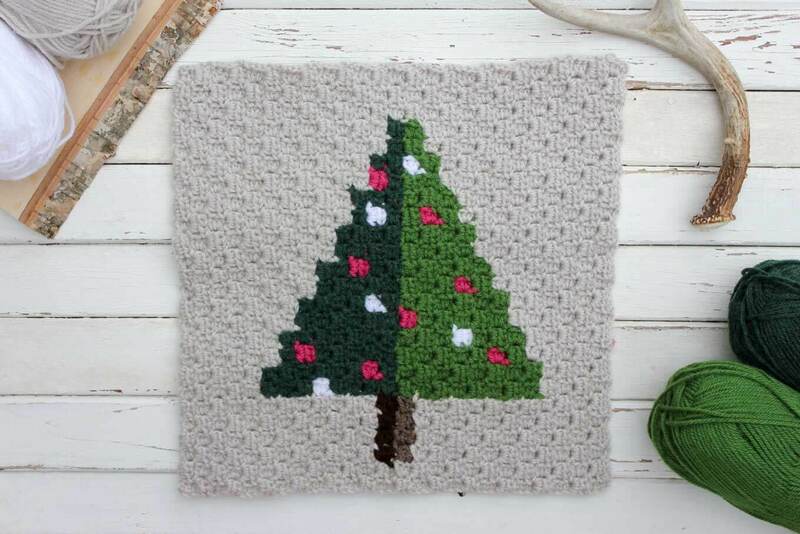 This free corner to corner Christmas tree pattern is the third in a series of nine squares I’m creating for a winter-themed graphgan. These blocks work up to be the perfect size for a throw pillow as well! If you’ve been following along lately, you might have noticed two things. 1. It’s still very much summer. 2. I’m working on a Christmas afghan. The thing is, I have done the start-a-Christmas-project in mid-December thing before and it has never gone will for me. So this year, I’m working on these blocks way ahead of time so that I (and hopefully some of you!) will have plenty of time to finish this afghan and enjoy it during the actual Christmas season. 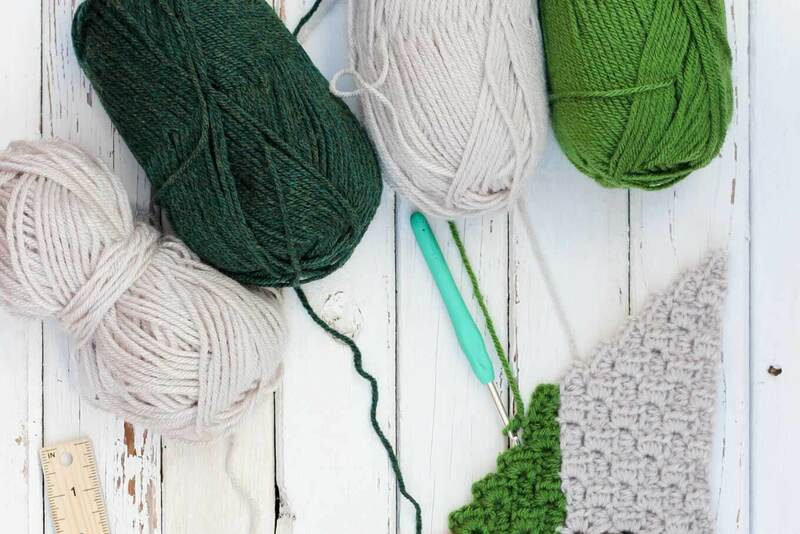 Never tried C2C crochet before? 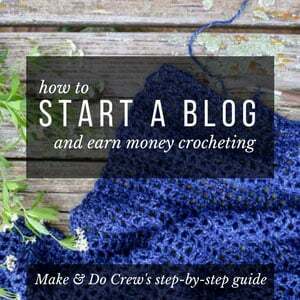 I was in the same boat three weeks ago, but this video by The Crochet Crowd and these resources from 1 Dog Woof have been really helpful while I’ve been learning the c2c technique. 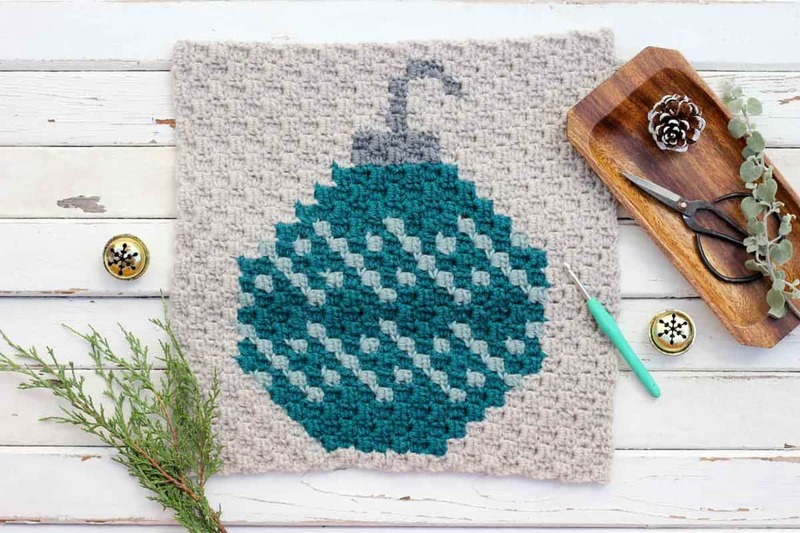 The two free graph patterns I’ve shared so far have included a modern Rudolph the reindeer and a monochromatic bulb ornament. 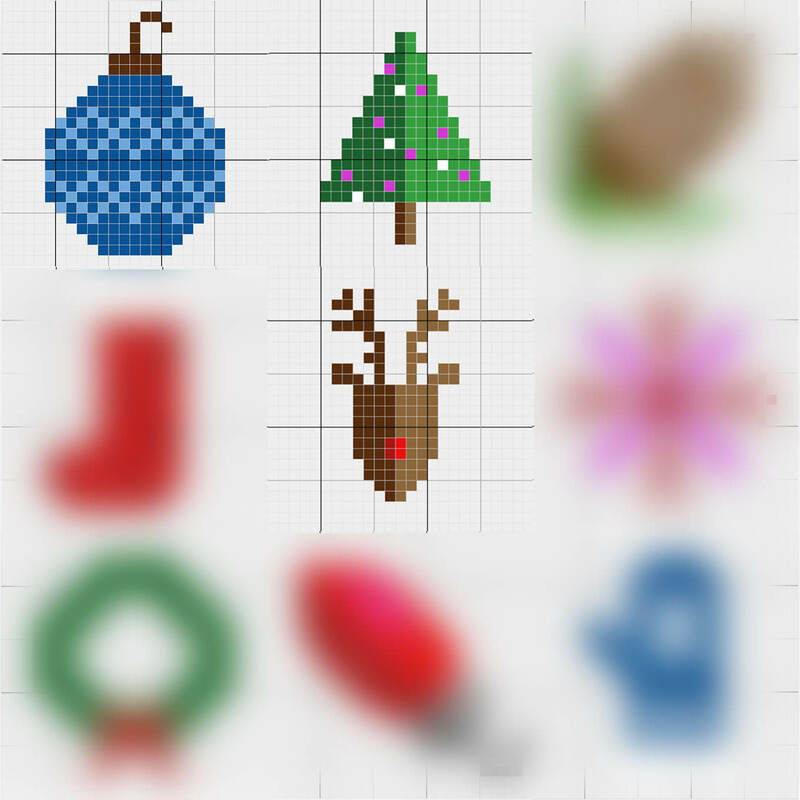 My idea with this Christmas graphgan is to keep the illustration style minimalist so that the resulting throw feels contemporary and appropriate in anyone’s home, regardless of your decorating style. This week’s square was probably the easiest graph to follow so far. For the others, I have been drawing lines across my graph to make sure I was following the rows appropriately, but I found this one much more intuitive to just crochet and reference the chart periodically as I went. The effort that you save in chart-reading for this one though will unfortunately go to weaving in the ends. 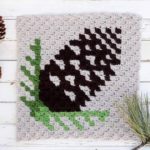 My three-year-old said she likes this square best because touching it “feels like hair.” So, if you’ve ever aspired to have hairy crochet, this project will deliver. Luckily, weaving in the ends on this square actually went much faster than I thought it would. I made a little video to make the process more fun for myself! 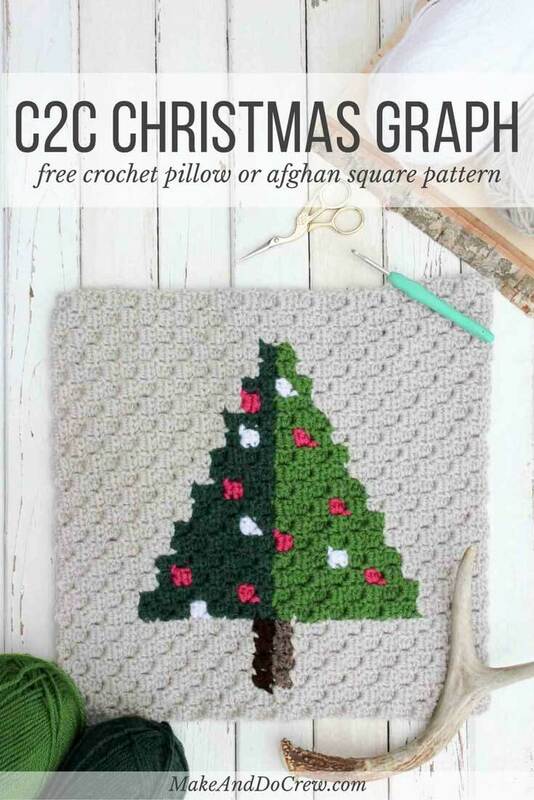 If you’re not ready to crochet an entire holiday afghan, you could use any of these Christmas C2C squares to make a pillow front and then make the same sized square for the back in a solid color. Then it’s super easy to sew the squares together like I did in this pillow pattern. This square pattern is about 15×15″, so a 14×14″ pillow form would work perfectly. 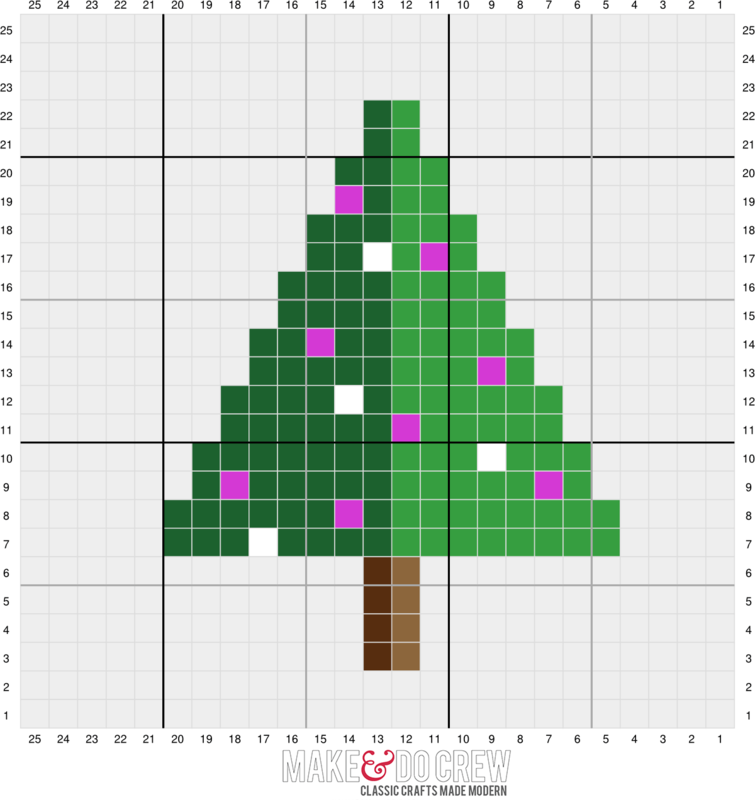 Download the free corner to corner Christmas Tree graph! Ooooooh how pretty! I am glad I found this blog just now! 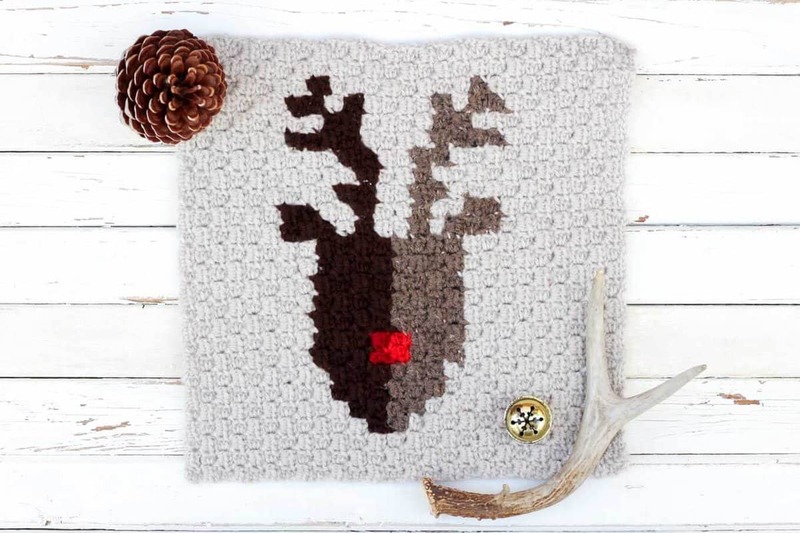 I have never tried C2C but this has given me theinspiration to give it a go! Yay, Bethany! This afghan is my first C2C project too. I am having so much fun with it. I’d love to hear what you think. And let me know if you figure out any good tips or tricks as you go. If you check out the first post in this afghan series, I linked to the videos that I found most helpful as I was teaching myself this technique. OH how I remember you and your sisters staying up on Christmas Eve trying to finish each other’s presents! Each of you promising not to look at what the other was making? I am so glad you finally figured out that it is much easier to start Christmas in July! Maybe some day your mother will learn too?? Thanks, John! I’m happy to have you here too! This afghan is my first c2c project and I’m having so much fun with it. It’s just so cool to see the illustration materialize before your eyes in yarn form. If you want to design your own graphs, you should def check out StitchFiddle.com. 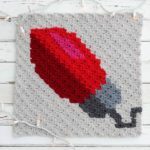 It’s what I’ve been using to make all my c2c patterns. And it’s free! Thanks so much, Jennie. 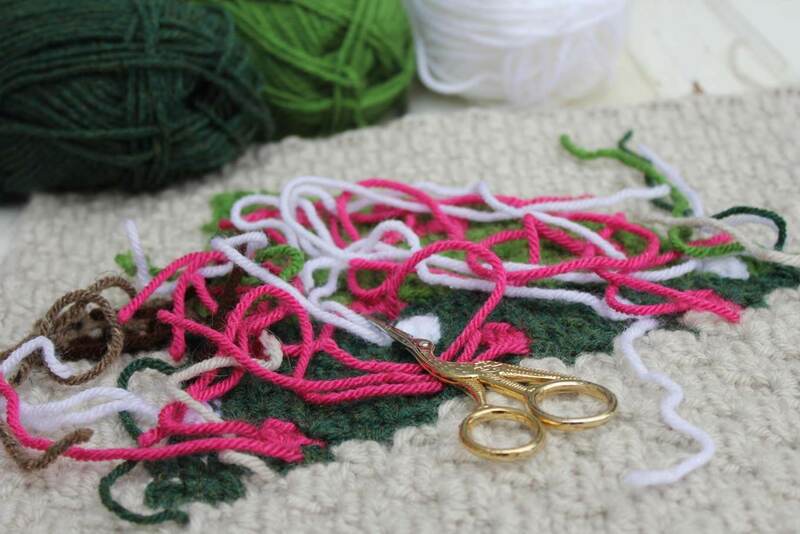 It’s been so fun to see the illustrations come to life in yarn form. 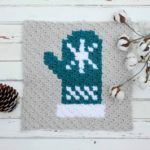 I’m really excited to share the other patterns! The Christmas tree Block is not on Raverly like the others&I was wondering why not? Great question, Renee. I just haven’t gotten around to adding it yet. 🙂 Thanks for the reminder! 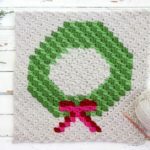 I just found your Christmas c2c graphs, they are wonderful, beautiful, and you have them for free! OMG thank you so much. I know this is a lot of work designing the blocks, and it takes up a lot of your time, and that is so special. 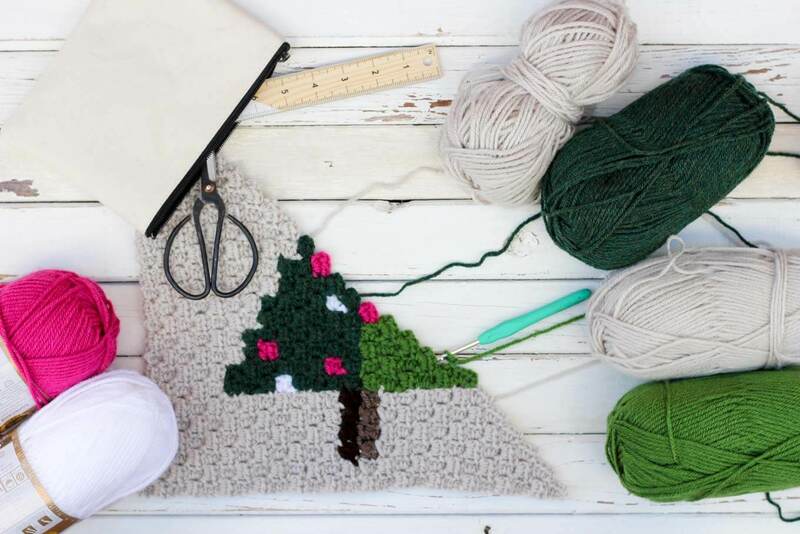 I’m going to enjoy catching up and making a beautiful Christmas afghan for this year. I’m going to follow you so I don’t miss anything else. Hey! Welcome, Lisa! They ARE a lot of work! But I’ve also really fallen in love with c2c. I feel like a kid again drawing pictures when I’m designing these. I’d love to see your completed afghan! I think this is the perfect time of year to start one.